I'm so lucky to be able to do what I do, and when Mrs Little Lending Co calls for dresses for a shoot, there is literally no other answer but "just tell me when and where!" The Festival Brides shoot took place at Langley Abbey, near Norwich, just a few days after the Most Curious Wedding Fair at St Andrews Hall. With The Little Lending Co.'s and Swaffham Florist's stand from the show as the shoots inspiration; minimal, chic, luxurious, texture being the keywords, we decided it had to be separates from Sassi Holford and a gorgeous peach toned Maids to Measure gown. "A contemporary, minimal shoot with modern feminine fashion. 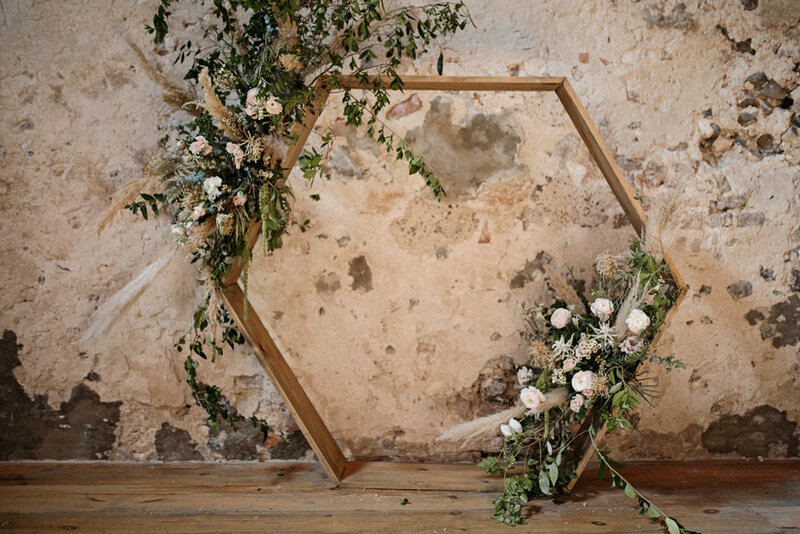 Luxe but simple details with striking honeycomb structures with wild and untamed florals. The shoot came from my collaborative concept for the Most Curious Wedding Fair in Norwich back in April with Swaffham and Fakenham Florists. We wanted to incorporate lots of textural and tactile flowers and foliage using Pampas grass to really shape the arrangements, which would capture the imagination of the curious couples at the fair. A palette of washed taupe, dusky pink and a dark inky blue adds a some edge, mixing linens of cotton, linen and velvet through the shoot plus brass and gold candle holders for timeless appeal. A simple cake stack in brushed water colours reflected the palette too. Paired back bridal fashion came from Maids to Measure with a soft pink tie back dress, Rembo Styling slim silhouettes with geo lave patterns and fresh, new gem stone pieces from Eclectic Eccentricity with slick footwear from Florence. Undone chignon and tucked up pony’s for the hair and feminine soft pink dewy, iridescent make-up all part of the look for our girls." Penny - The Little Lending Co.
You say minimal, modern, chic, I immediately turn to the gorgeous Sassi Holford, with beautiful clean lines, amazing figure flattering shapes and stunning fabrics, Sassi knows how to dress a woman! For the shoot, we decided to go for the separates range, with the Edith Bodice and Maisie tulle full length skirt, super clean and crisp, with enough softness to match the pampas grass and amazing texture of the walls at Langley. 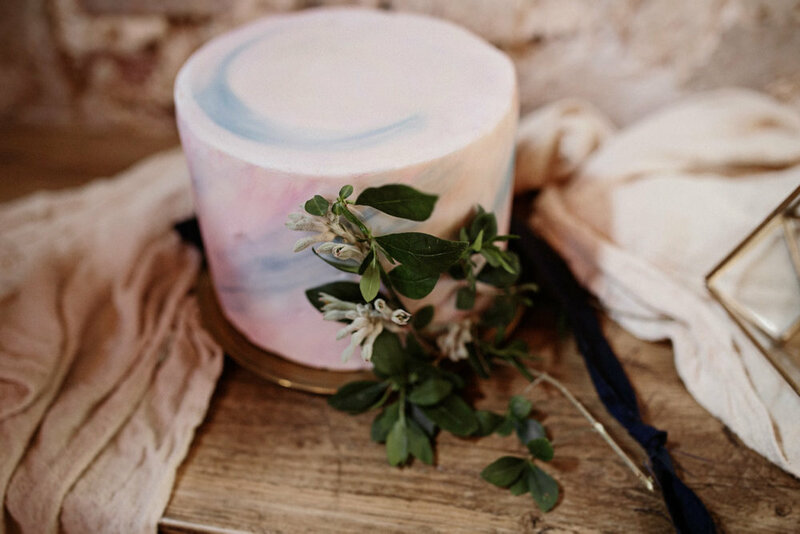 Alongside our Bride, our Maids wore 'Soho' by Maids to Measure (a long time favourite of Penny's) which happened to be in the colour 'Just Peachy' perfect to sit along the taupe, blush and navy featured in the amazing florals and beautifully hand painted cake. I am still massively obsessing over our Brides gorgeous ponytail and Maid's glitter lips, just need to work out when I have combine both those looks for myself! As always, all my thanks to Penny for inviting me along to the shoot, always an honour to be asked along! Love working with all you guys! Make sure you check out Festival Brides for the original post and even more gorgeous images!